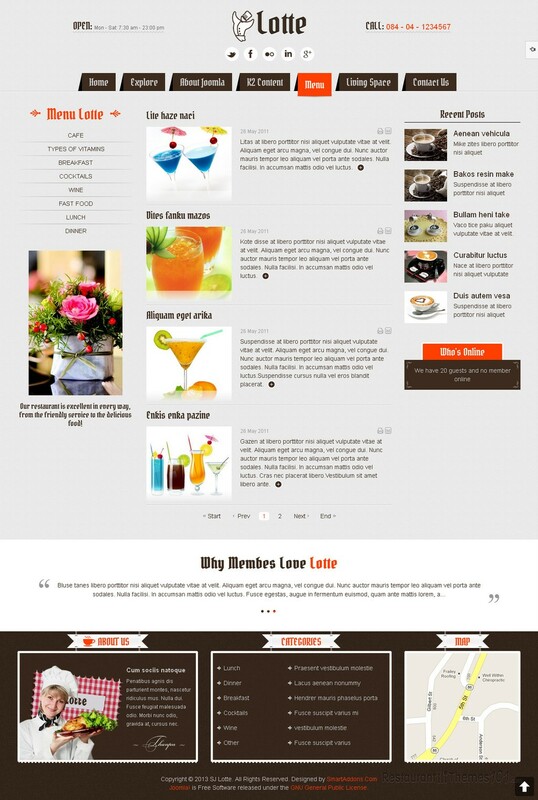 SJ Lotte is a responsive restaurant template for Joomla created by SmartAddons and featured at Mojo Themes. This template is integrated with both Content and K2 components into the core, which allows you to choose between the clean simplicity of the default Content component, or the empowered and more sophisticated K2. A front end CPanel is included allowing you to change site styles, fonts and layouts instantly and easily, or reset them to default within just few clicks. There are 8 preset color styles you can choose from, each one of them brings its own unique look and feel, and they all look fantastic. You will be able to set your own title, logo and slogan, and make your website personal and fitting your desires. The homepage of this responsive Joomla restaurant theme features a full width slider, a perfect place for showing the nicest photos of your delicious foods. No matter what photo you place in the slider, it will be the first thing your visitors pay attention to when they enter your homepage, so you need make the best of this slider and add the nicest, eye catching photos. 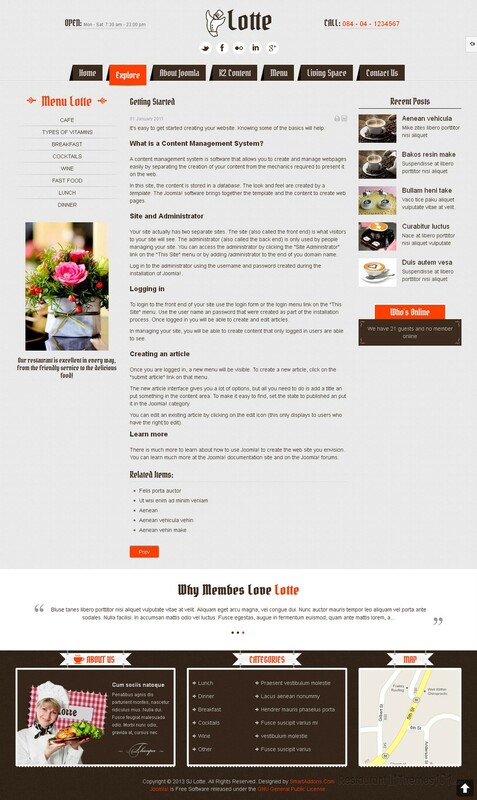 A pretty, categorized menu will enhance your website and let your visitors check out your food easily because it does not only look great, it is very nicely organized as well. Feature your most popular dishes or your special offers on your homepage by adding resized photos and teasing your visitors with quality photos of delicious bites that will grab their attention. 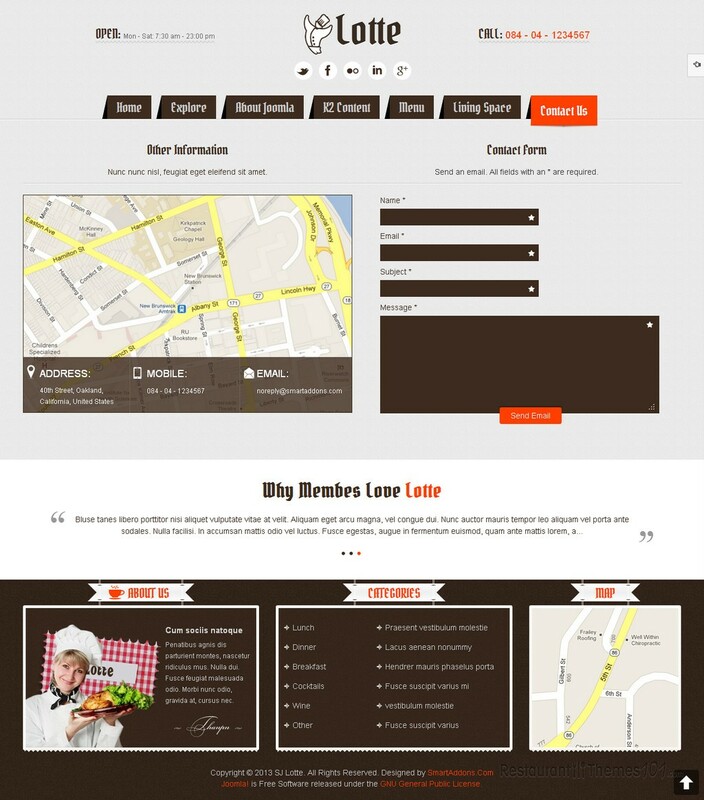 Actually, this template allows you to feature many menu items, and each one of them will look great and teasing. SJ Lotte features “events”, allowing you to announce anything interesting you might be organizing at your restaurant and it also features Google Maps for all your visitors to easily get the right directions to your restaurant. Social integration is also nicely done, with options of connecting to the most popular networks. Every inch of your website will look perfect regardless of the device it is viewed from, because this template is completely responsive.